Sometimes it’s hard to talk to strangers. It seems a bit easier when you travel, because everyone’s a stranger. And the best part: strangers often turn out to be incredibly kind and helpful, and leave you with great stories to tell on my podcast sometime down the track! And that’s exactly what’s happened with my three guests today. I love this photo with Kelly (left) and a friendly Cambodian tuk-tuk driver. Why do they all have a beer? Well, you will have to listen to the podcast to figure that one out! Enjoy! 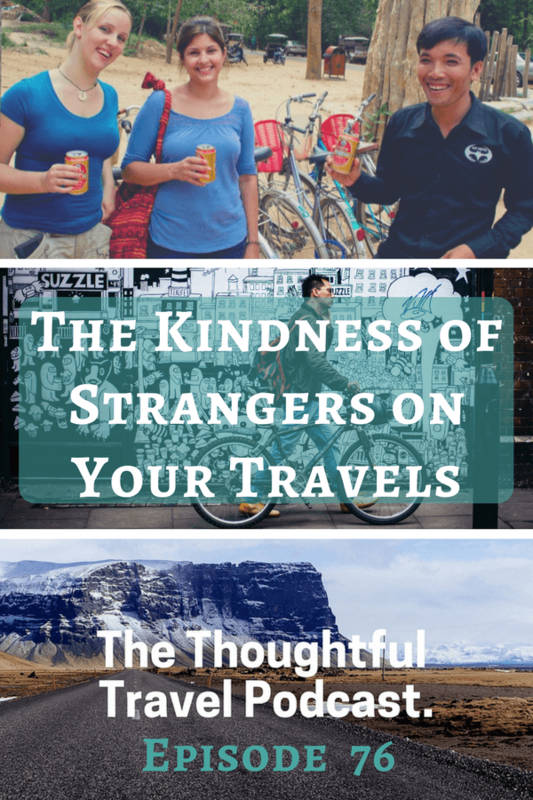 While sometimes we are inclined to feel suspicious of strangers, the fact is that 99.9% of people are good and when you travel, you will often come across some especially kind strangers. In Episode 76 of The Thoughtful Travel Podcast, I chat with three travellers who have had some fantastic and even life-changing experiences meeting strangers on their travels. First up, Kelly Dunning of Global Goose has a funny and heartwarming tale to tell of a day out cycling in Angkor Wat which could have ended badly, but really didn’t! Similarly, my next guest, Samantha Fisher of High Hopes Travel, ended up in Paris one summer night with no accommodation around, and this could have had an unhappy ended too but thanks to the kindness of strangers it was quite the opposite. My final guest is Colin of Parenting, Passports and Profits who tells a tale of a bunch of strangers he met when he headed to the Rocky Mountains in search of a ski season job, and how these random meetings turned into a life-changing friendship. The more I travel, the more I realize the great amount of good people around the world willing to help you when problems or difficulties appear while travelling. I love this because it gives me a feeling of confidence in humanity, of fraternity.. And I loved listening to your guests’ experiences. There is an special place in the world where I have experienced this kindness. This city is Istanbul, and it’s probably my favourite city. I’ve been there several times.. and I have to say that my first time, I went there with prejudices, even with a little bit of distrust.. when you go to an unknown place, specially if the culture is quite different to yours, you tend to be alert to everything, to feel suspicious; but then the kindness of its people surprised me, and I have quite a lot of examples of moments in which I felt truly helped, protected and supported by strangers. When I read the title of this episode, even before listening to it, the first place that came to my mind was Istanbul. Strangers giving my mother a lemonade for free, just because they saw her crying a little bit after receiving bad news on the phone; a woman in a mosque, sitting on the floor next to my friend an me, who insisted on helping us with our map even though we didn’t speak her language nor did she speak ours :), an stranger who insisted on leaving me his cell phone because mine did not work (I hadn’t even asked for help! )… all of them without expecting anything in return. Finally, let me leave here a book recommendation, which is a good example of unexpected meetings with good people that helps you on a travel, which can end up in a great friendship: ‘The Shadow Land’ by Elizabeth Kostova. Thanks for sharing this episode Amanda. The stories and the comments and your own thoughts are proof positive of the inherent good nature inside people all over the world. Yet, it’s sometimes hard to describe to non-trusting people why travellers often make decisions that make no rational sense!